Raider fans are the best! 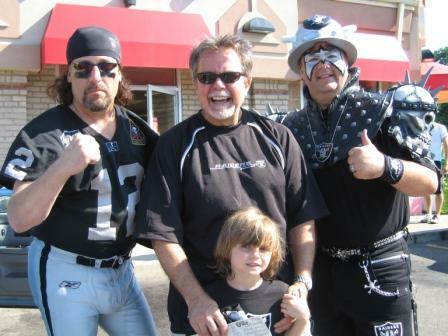 Here I am hanging out with a couple of Raider fans at the hall of fame! ~ by Rod on April 11, 2008. Hey, that chubby guy in the middle looks like a really funny guy! This entry was posted on April 11, 2008 at 10:45 am and is filed under Raider Fans.You can follow any responses to this entry through the RSS 2.0 feed.You can leave a response, or trackback from your own site. Previous: Raider Fans are the Best!